on the site from the large Eagle Harbor Life-Saving Station. 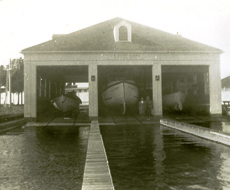 three boats in their bays. The Museum also has a 26-foot pulling surfboat which is being now being restored. Once the26-foot surfboat is delivered from the restorer, the museum will display all the early wooden rescue boats used by the U.S. Life-Saving Service and the U.S. Coast Guard. 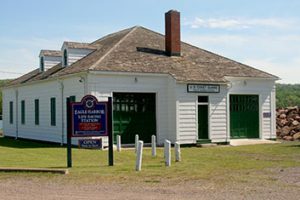 of the Eagle Harbor Life Saving Station. The Museum has a glass enclosed viewing area inside the restored Life-Saving Station boathouse. It has one display about the Eagle Harbor station’s most famous rescue, the 1913 wreck of the steamer L. C. Waldo. 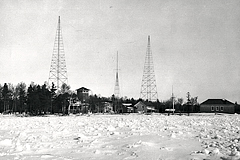 The Waldo was wrecked in a November storm off Keweenaw Point. Nine Eagle Harbor and Portage Station rescuers were awarded the Life-Saving Service’s highest honor, the Gold Medal, for their heroic role in assisting in the rescue of 24 souls and one dog from the Waldo. Additional displays feature the collections of memorabilia of Anthony Glaza and Oscar Marshall family. The Marshall family served both the Portage and Eagle Harbor Life Saving Stations.. Hours & Admission – The Life-Saving Museum will be open from 9 am to 6 PM daily from mid-June to early October.There is no admission fee for this museum but a donation is appreciated. Related Links -You may wish to explore the following sites for additional information about life saving stations and the wreck of the Waldo.